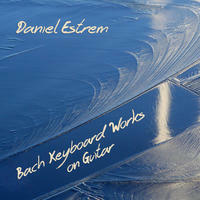 Daniel Estrem : Bach Keyboard Works on Guitar. Johann Sebastian Bach (or J.S. Bach), (1685-1750) a prodigious talent at the keyboard was known for his formidable technique and improvisational skills. His keyboard compositions are widely varied, encompassing the entire course of his lifetime. Having never received academic training in composition, he acquired his knowledge of counterpoint and harmony by analyzing the works of others. He studied the music of notable composers of previous generations as well as his European contemporaries. The concertos of Vivaldi profoundly influenced his ideas of harmony and musical form. The first track on this recording (Allegro from Sonata #5) reveals the Vivaldi influence yet bears the indelible stamp of Bach. Bach's music often seems to exist beyond any particular instrument. The same piece of music can work as effectively on a piano as a guitar, as an orchestral arrangement or a choral work. Bach's exploration of harmony delved deeper than many composers of the time and occasionally his music contains surprising dissonance and can transition to unpredictable harmonic areas. It is interesting to note that for someone whose compositions are said to be the basis for Western music, there is no textbook written by Bach. His work stands on its own and has been the source of musical knowledge for many generations.